Life - more precisely, life under the Soviet system - was not kind to artist Alakbar Rezaguliyev (1903-1974). During the Stalinist repressions, Rezaguliyev was arrested three times for supposedly spreading pan-Turkist ideas. Suffering the fate of thousands of other intellectuals and creative geniuses, he spent the majority of his adult life in prison and exile, nearly 25 years. Perhaps the worst aspect of Rezaguliyev's sentence was the fact that he was not allowed to pursue his dream of becoming an artist. By the time he was free to return to Azerbaijan in 1956 after Stalin had died, he was desperately out of practice, psychologically broken and too weak even to hold a pencil. Left: Alakbar Rezaguliyev's linoleum prints, "Kolkhoz Collects the Wool" (1966). Despite the odds, Rezaguliyev worked tenaciously to develop his talent and make a name for himself. 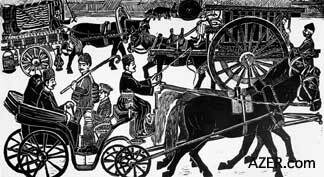 He became well known for his art, especially for his remarkable series of black-and-white linoleum prints depicting scenes from turn-of-the-century Baku. Living so long inside those prison walls left its mark on Rezaguliyev's works - but not as one might think. Most of his prints glorify work, although not in a way that honors this labor for the sake of production alone. Rather, the artist invites us to appreciate the mundane, ordinary and sheer physical process of creating with one's own hands and mind. 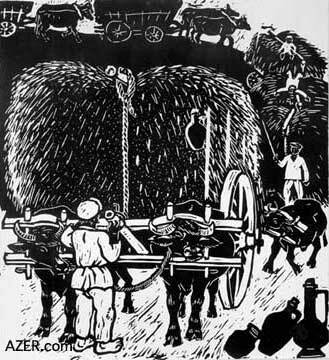 Many of his prints depict workers going about their everyday chores - shoeing water buffalo, loading hay on wagons, making flatbread (lavash) or even slitting the bellies of sturgeon to harvest caviar. To gain insight into Rezaguliyev's tragic life and his motivations for creating such nostalgic images, we turned to Rezaguliyev's youngest son, artist Aydin Rezaguliyev, and the memories of the artist's oldest daughter, the late Adila Rezaguliyeva. 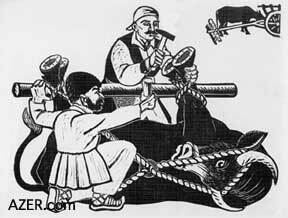 Left: Alakbar Rezaguliyev's print "Shoeing a Water Buffalo". Alakbar Rezaguliyev was born in Baku on January 31, 1903, into the large family of a small businessman-shopkeeper. Although there were no artists in his family, Rezaguliyev showed artistic talent at an early age. "When my father was a child," Rezaguliyev's son Aydin retells, "his grandfather spoke with the akhund [local religious authority]: 'Our little Alakbar draws pictures. What do you recommend?' The akhund warned: 'Don't allow him to draw. It is forbidden by God to draw pictures of human beings; it's a sin.'" The akhund's words fell on deaf ears. Rezaguliyev went on to study art at the Baku Art College just after it was established; he graduated in 1922. He then pursued his passion for art in Moscow at the Technical Art Studios School from 1925 to 1928. Rezaguliyev supported the Communist Party when it was first established in Azerbaijan in the early 1920s. In fact, he was part of that first generation of "Komsomols" in Azerbaijan. Komsomols were high school students who were on the path to becoming full-fledged members of the Communist Party. Such a process usually started for children in elementary school, who became "Octobrists"; older children became "Pioneers". Left: Rezaguliyev's prints: Modes of transportation in Old Baku at the turn of the 20th century. Below: "Wool for Sale" (1963). Right: Crushing mulberries to make a thick syrup. Rezaguliyev's plan to become a successful artist and a member of the Party was abruptly halted in 1928. One of his friends, Ibrahim, was arrested for spreading "pan-Turkist ideas." At that time, Stalin and the other Soviet leaders were especially sensitive to the possibility that Turkey could try to gain control over the Turkic republics of the USSR. Turkic-speaking peoples lived in a wide swath of territory along the Soviet southern flank and were united by similar Turkic languages. These Turkic republics included Azerbaijan, Kazakhstan, Turkmenistan, Uzbekistan and Kyrgyzstan. Anyone who promoted unity amongst Turkey and the Turkic peoples was targeted and accused of "pan-Turkism", an indictment that often resulted in exile and death. Since Rezaguliyev was associated with Ibrahim, he was arrested, too, and sentenced to six years of exile in the freezing - cold, sparsely inhabited region of Arkhangelsk in northwest Russia. "I suspect that somebody falsely brought accusations against my father," Aydin says. "After all, he was one of the first Komsomols in Azerbaijan, he believed in the Communist system. How could such a person turn around and curse the government? It just didn't make sense. For sure, he was imprisoned without any evidence." During his exile, Rezaguliyev underwent an arranged marriage. His father, mother and future mother-in-law somehow managed to bring his bride, Sona, to him at Arkhangelsk. Sona lived with him there for a while, then returned to Baku and gave birth to their daughter Adila (1936-1997). After his release and return to Baku, Rezaguliyev ran into one of the Bolshevik leaders, Ruhullah Akhundov, who was surprised to see him out of prison. "Hey, you dumb guy, are you back here again?" And with those words, he was promptly arrested again and exiled to Solovki in the icy Arctic. Right: Women's traditional apparel, especially in some rural areas in the 19th century (1960). "I was six months old in November 1937, when Father was arrested," daughter Adila recalled on a television feature about Rezaguliyev. "I didn't see him again until 10 years later, in 1947. At that time when we met again, we didn't recognize each other. Then he broke down and sobbed, saying that he was so thankful to his parents for taking care of his keepsake for all those years." Between 1947 and 1949, Rezaguliyev and his family lived in the northwestern regions of Azerbaijan. "The authorities wouldn't let him live in Baku," Adila said. "We had to live in Ganja and Shaki. I remember that he used to prepare sketches for the silk factory in Shaki, where there was a large silk industry at the time. He also taught school there. "I remember one day when I was sitting with Father and Grandpa, a rather handsome man by the name of Bahram dropped by. He was the producer of the Ganja Theater. He fell to his knees in front of Father and begged him: 'Forgive me for those years, for those words.' My father didn't say anything and just turned his head away. Grandpa said to Father: 'Alakbar, don't you see that he's asking for your pardon?' Father answered: 'No, Dad, I can never forgive him. For his lie, I had to spend nearly half of my life in exile.'" 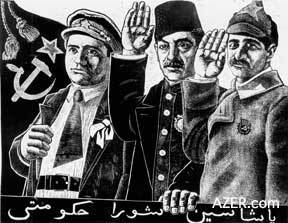 Left: "Long Live the Soviet Government" (Azeri language in Arabic script): These three figures played pivotal roles in the establishment of Soviet power in Azerbaijan: Sergey Kirov (1886-1934), Nariman Narimanov (1870-1925) and Grigori Orjonikidze (1886-1937). Ironically, under Stalin's authority, they all became victims and were annihilated by the system they helped to create. In 1949, shortly after his second daughter, Sevil, was born, Rezaguliyev was arrested yet again and sent to the frigid Altai Province in northern Russia. While in exile, he married again, this time to a German girl named Berta, whose parents and grandparents had been living in a German settlement in the Saratov Autonomous Region. At the beginning of World War II, Berta's family had been sent into exile, just like all of the other Germans who were living in the USSR. "I was the only one in the family who knew about Father's second marriage," Adila confided. "He wrote me secretly and asked me not to be angry with him for marrying again, that he did it only to keep from dying of hunger and cold. He found a warm home for himself by marrying that woman." Rezaguliyev and Berta had two sons, Ogtay and Aydin, and a daughter, Sevda. In 1956, three years after Stalin's death, Rezaguliyev was exonerated and released from exile. Stalin's repressions were over. By the early 1960s, Berta and her children were allowed to join him in Azerbaijan. Aydin remembers the pressures of adjusting to Baku and blending in with his father's existing family. "I was in the second grade at the time, and I remember how difficult it was for us when we came to Baku. We only knew how to speak German - not Russian or Azeri. Slowly, things got better. We lived in the Montin settlement, which is in the Narimanov district of Baku." Not surprisingly, those 25 years of exile had taken a serious toll on Rezaguliyev's health. "When Father came back, his hands were stiff," Adila recalled. "He had trouble just holding a pencil." "The exile greatly affected my father's personality," Aydin adds. "He became very serious. You can see it in his photos: in the early ones, he was always smiling, but after he was exiled - never. Being imprisoned all those years morally broke him." Rezaguliyev threw himself into his art, working day and night to develop his technique. "I remember my father would leave the house each day at 7 a.m. and go to work at his studio," Aydin says. "He only came home for lunch for 30 minutes and then went back to work at his studio until evening." "Whenever I saw him, he was busy with work," Adila remembered. "I often asked my father why he worked so much. He would tell me, 'I want to reclaim all that time that I've lost. Those years took all of my ideas, works and memories away from me. That's why I have to make the most of the remaining years of my life.'" Aydin says it was rare for his father to work with colors after he returned from prison: "He worked almost exclusively in black and white. Maybe he felt like he didn't have enough time to master the use of color. Or maybe being in an environment of stark white snow had affected his sight, robbing him of his ability to deal with the nuances of color." Fellow artist Rasim Babayev (1927- ) encouraged Rezaguliyev to work with linoleum prints because the technique was less complicated and didn't require the use of color. Taking Babayev's advice, Rezaguliyev went on to create numerous prints, including more than 150 black-and-white prints depicting the Baku of his childhood. Time and again, until the end of his life, he kept adding works to what he called his "Old Baku" series. "All of the ideas and memories from his heart were included in this series," Aydin says. "Here were the old characters that he remembered from his childhood: the 'Pomegranate Vendor,' the 'Oil Seller' and the 'Lamplighter'. He knew them all by heart. They are among my favorite works of my father's." Many of Rezaguliyev's prints show people involved with daily chores, whether it be washing carpets, lighting lamps or selling water. One wonders if he paid so much attention to the routines of everyday life because he himself was deprived of the chance to be involved with such mundane activities during his nearly 25 years of exile. Due to his hard work, Rezaguliyev managed to gain a reputation before his death in 1974. In 1963, at age 60, he had his first solo exhibition. In 1964, he was named Honored Art Worker. His works were featured in museums throughout the Soviet Union, including the Pushkin Museum, the Hermitage and the Museum of Eastern People. Next year marks the 100th anniversary of Alakbar Rezaguliyev's birth. A Jubilee will celebrate his creative life in the midst of extreme hardship. This article was based on several interviews with Aydin Rezaguliyev conducted by Betty Blair, Jala Garibova and Gulnar Aydamirova, plus the recorded interview with the late Adila Rezaguliyeva that appeared on the television program "Yaddash" (Memory) on AzTV. To read more about Alakbar Rezaguliyev, see the article "Street Scenes from Yesteryear: The Linoleum Prints of Alakbar Rezaguliyev" in AI 8.2 (Summer 2000).